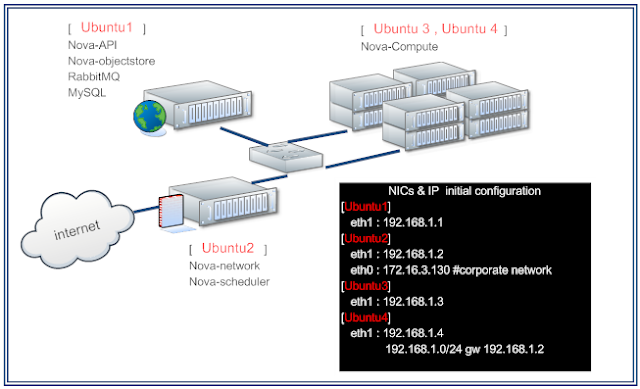 While the multi-node install instructions currently just describe two nodes, a cloud controller node and a compute node, there are many considerations for adding additional nodes in multi-server installations of OpenStack Compute. An admin at Rackspace is working on a best practices page for multi-server installations. It's not just the services you can think about installing on other nodes but optimizing the database and messaging. For example, you could mirror all seven services on a second node for one type of multinode installation, but that doesn't necessarily solve specific performance issues. You could have all seven services on one node and then have a second database node, splitting read/writes through a database proxy. Or, if it isn't the database read/writes that are slowing you down, but the message queue gets large, and that slows your system, then add a second (or more) messaging node (RabbitMQ). Which nodes to add depends on the performance you're getting and what parts you want to ensure redundancy. There are many considerations and we plan to write more detailed instructions after we have tested at Rackspace. We are bringing more people on the project in January and I hope we'll have additional documentation based on our tests in about six weeks from the start of the new year.